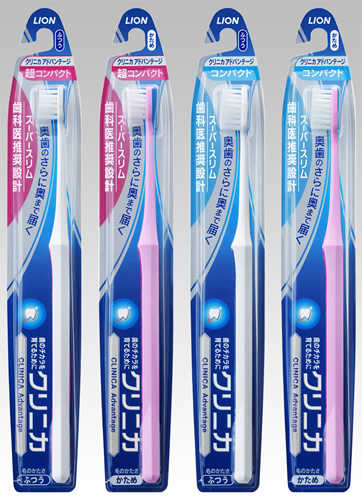 Lion Corporation (President: Itsuo Hama) announces the nationwide release of the CLINICA ADVANTAGE Toothbrush on Wednesday February 27, 2013. Featuring a dentist-recommended design, this new toothbrush employs a super-slim shape with the thinnest head and neck on the market, allowing the brush to smoothly reach the back of the molars. The main reasons why people lose their teeth are cavities and gum disease, both of which are caused by tooth tartar. Because brushing the molars is difficult, tartar tends to remain on them, resulting in a high risk of cavities and gum disease. In fact, 14% of people in their 30s or 40s lose their molars for these reasons. From this perspective, about nine out of 10 dental hygienists emphasize that the most important function of the toothbrush is to facilitate brushing the molars (according to a 2012 Lion survey). The market for compact and ultra-compact toothbrushes grew from 32% in 2002 to 57% in 2012 as a share of the total toothbrush market in Japan3. This reflects a general preference among consumers for toothbrushes designed with a compact head that can easily reach every tooth in the mouth, including the molars. Nevertheless, the head and neck of conventional toothbrushes are cumbersome when reaching the inner side of the cheeks and teeth, even if the head is compact. Consequently, these toothbrushes cannot reach the back of the molars unless the mouth is opened very wide, so the molars are often left unbrushed. In response to these limitations, Lion’s Oral Care Research Laboratories has been pursuing technical developments better enabling toothbrushes to reach the back of the molars. As a result of this research, it succeeded in developing a super-slim toothbrush by slimming down the thickness of the toothbrush head and neck to the thinnest level on the market, thereby reducing the size of the toothbrush area that enters the inside of the mouth by 30%4. 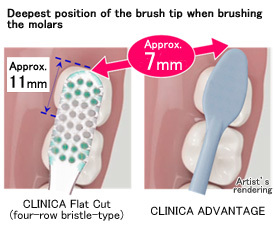 Based on these techniques for achieving a super-slim toothbrush, Lion is now releasing the CLINICA ADVANTAGE Toothbrush with a dentist-recommended design for smoothly reaching the back of the molars (as shown in the diagram at right). 3: Based on SRI surveys on the Japanese household toothbrush market for 2002 (January to December) and 2012 (January to December) conducted by INTAGE Inc.; the market for compact and ultra-compact toothbrushes is based on Lion’s definition. Lion strengthened the material for the toothbrush handle by utilizing polyacetal resin, which is commonly used for mechanical parts. This enabled a super-slim design with an ultra-thin head measuring 2.6 millimeters thick and an ultra-slender neck of 3.5 millimeters wide. Lion reduced the size of the toothbrush area that enters the mouth by 30%, and gently tapered the tip of the head. This gives the toothbrush better access to the back of the molars, where brushing movement is normally difficult because the cheek and teeth are in the way, and more effectively dislodge tartar (as shown in the reference material, below). The design of this new toothbrush has been evaluated as ideal for brushing the back molars (specifically the distal surface of the last molars) by 84% of dental hygienists, who are experts on tooth brushing5. The CLINICA ADVANTAGE Toothbrush features flexibly fitting bristles that gradually become sharper toward the tips. This allows the bristles to fit between narrow spaces between the teeth and between the teeth and gums to effectively remove tartar. The CLINICA ADVANTAGE Toothbrush has been designed with a flat-cut brush surface that is generally suitable for any row of teeth, as well as a compact head to make brushing motions easier inside the mouth, and a straight handle to better control the force and direction of brushing. The toothbrush handle feels natural to hold in a pen grip, which facilitates brushing motions with less pressure. Lion’s Oral Care Research Laboratories have been carrying out research on toothbrushes that can easily brush every tooth in the mouth, particularly the back of the molars where tartar tends to build up and increase the risk of cavities. As a result of this research, it succeeded in developing a toothbrush with a super-slim shape by slimming down the thickness of the head to 2.6 millimeters and the width of the neck to 3.5 millimeters. These techniques were then utilized for Lion’s new CLINICA ADVANTAGE Toothbrush. Lion evaluated the performance of the CLINICA ADVANTAGE Toothbrush compared to its previously released product in tests on human participants, and determined that the brush could reach about seven millimeters farther behind the molars and effectively remove about 1.3 times the amount of tartar on the back of the molars. Researchers had 18 male and female adults brush their molars for six seconds, and measured how far back the brush tips reached with a newly developed assessment system equipped with sensors. The results showed that the CLINICA ADVANTAGE Toothbrush reached about seven millimeters deeper than Lion’s previous product. 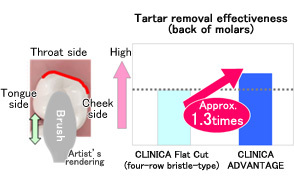 Researchers had eight male and female adults brush their teeth for three minutes, and measured how much tartar had been dislodged on the back of the molars (highlighted in red in the photo at left). The results showed that the CLINICA ADVANTAGE Toothbrush removed about 1.3 times more tartar than Lion’s previous product.